Willis T. “Terry” Pullins, 75, of Frankfort, died August 12, 2018 at his home. Will was born July 12, 1943 in LaPorte, Indiana to the late Willis J. & Bettilou (Wagner) Pullins. He married Sandra L. Palmore on June 9, 1963 at Mulberry Methodist Church and she survives. 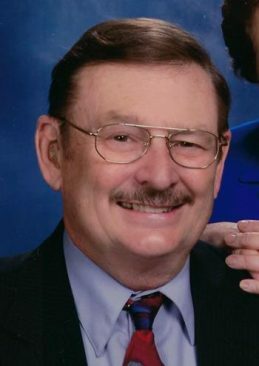 Will was a 1961 graduate of Medaryville High School and received his BA and MS Degrees in Education from Purdue University. He was proud to serve as an educator at Lebanon High School in Lebanon, Ind. for over 40 years, first as assistant principal and later as director of curriculum. Will was an active member of St. Matthew United Methodist Church. He was on the Red Barn Summer Theatre Board and shared his love and passion for acting through the Civic Theatre in Frankfort, Lebanon and Indianapolis. During his 28 years in the theatre, he won several Encore Awards, including best actor for Foxfire. He had also started directing plays over the past few years. He served on the Frankfort Library Board, the Friends of the Library Board, and the Membership Committee for Retired Teachers in Boone County. He and Sandy loved to travel, and he even won a grape stomping contest in New Mexico. Visitation will be 2-5 p.m. Saturday, August 18, 2018 at Goodwin Funeral Home, 200 S. Main St., Frankfort with additional visitation one hour prior to the service at the church. Services will be 2:30 p.m. Sunday, August 19th at St. Matthew United Methodist Church, 1951 Wilshire Dr., Frankfort. Pastor Phil Lake will officiate. Burial will be in Rest Haven Cemetery, Lafayette, Ind. Memorial donations may be made to Red Barn Summer Theatre, Clinton County Civic Theatre, Frankfort Public Library, or St. Matthew United Methodist Church. Wife: Sandra L. Pullins of Frankfort, 3 Sons: Steve (Kristie) Pullins of Huntington, W. Virginia, Jeff (Sharon) Pullins of Wichita, Kansas, and Brett (Lane) Pullins of Cincinnati, Ohio, Sister: Della Gale (Anthony) DeRollo of Alamogordo, New Mexico, 4 Grandchildren, Mia, Anna, Benjamin, and Drew. Remembering you fondly, through my days at LHS and my children’s days there. You were always there for all of us and we were lucky enough to have you as a mentor during Chris’ first play. You will be missed by many. We are so sorry for the loss of Will. Words don’t seem to be enough to express sympathy at a time like this. It was a pleasure to know him. Gordon had many happy times running with him earlier in their lives. Know that our prayers are with you and may God grant you peace in this time of sorrow. My sympathies to the family. I worked for Will at LHS. He was a great man. I am so sorry to learn of Will’s passing. He was vice principal at LHS when I worked there. You have my prayers and my love. Dear Sandy, I just learned of Terry’s passing & I am so sorry to hear of the sad news. He was a great guy and Eloise and I were looking forward to seeing you and Terry again at our upcoming 57th class reunion! Our thoughts and prayers and condolences to you and your family. Blessings to the Pullins family as he was such a blessing to so many. Jerry and I were shocked to learn of Will’s passing on FB. We had no idea and a friend of yours was so kind as to send us the obit to us. Jerry remembers fondly the time they taught together at North-Newton and also the times we had together when you came down and stayed with us. We saw your travels on FB and got to see your family expand through the years. Our heart is heavy, but we know that the God of all comfort is there. Sandy I didn’t know you well but you are family. I want to extend my deepest sympathy to you and your family . I met you once at Terry’s retirement party when my sister Peggy and I brought our mother Martha Wagner to help celebrate the occasion. Gale De Rollo, you have my deepest sympathy also. We have lost a sibling too and it isn’t easy to carryon but we must. You all are in my prayers and may God grant you the peace of understanding and be with you in this sad time. God Bless. I’m so sorry to hear of Will’s passing. I enjoyed reconnecting with you and Will during tax season. I enjoyed hearing about what the boys have been doing. Both of you have always been huge supporters of youth. Will is definitely going to be missed. I cannot come to calling as I will be with the volleyball team at a tourney. Please give “Bear” a hug for me. Sandy and Family, so sorry for your loss. Thinking of you and praying for comfort during this time. Heartfelt sympathies and prayers to the Pullins family. May your memories bring you peace. RIP Terry. Sandy, our condolences in the loss of Will. He was a great person and our lives are richer for knowing you and Will. We are so overwhelmed to learn about Will passing away! Did not know this. Don worked with Will at Lebanon HS and our families then became friends which kept us in touch through the years. We visited some through the years at our homes and camping. We are so glad Sandy and Will visited us in the U.P. about 3 years ago. He will be greatly missed. He will be missed, our prayers are with you. Sorry to hear of your passing..Love and prayers to the family. Many fond memories at LHS..